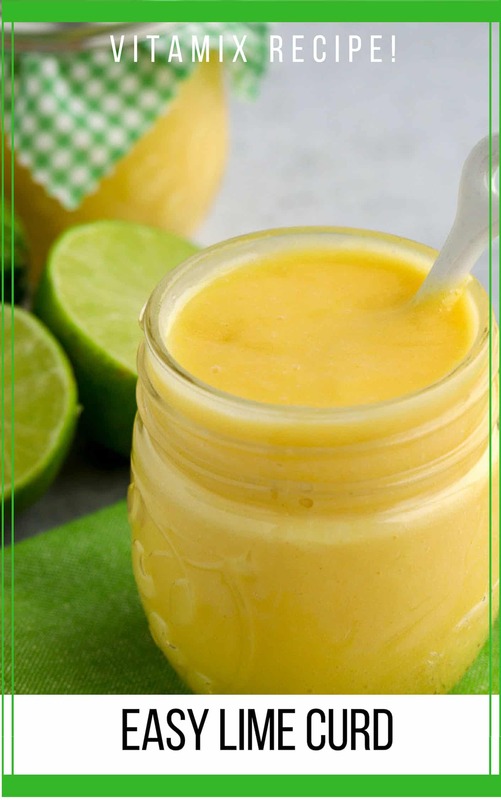 Lime curd is a creamy citrus spread thickened with sugar, eggs and butter. 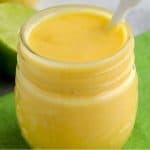 This lime curd recipe is made in less than ten minutes in the Vitamix and is a perfect filling for macarons, cakes, and sandwich cookies. You might even eat this fruit curd by the spoonful! Lime curd is similar to the more popular lemon curd. It is a thick and creamy spread that starts with lime juice and lime zest then takes shape with eggs, sugar, and butter. It’s not quite as thick as a pudding or custard but it has similar characteristics. Traditional curds are made over the stop top but I love shortcuts! Try this microwave lemon curd recipe or this Vitamix lemon curd too. Generally speaking, one lime has about 2 tablespoons of juice. For this recipe requiring 1/2 cup lime juice you’ll need 8 tablespoons or 4 limes. I have made this recipe with anywhere from 3-5 limes. Microwave the lime for 10 seconds. Roll the lime on the countertop. Keep the limes at room temperature– cold limes will not let off as much juice. 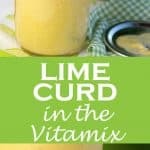 Making this Vitamix lime curd is so easy. It will need time to set in the refrigerator so plan ahead. Put the lime zest, lime juice, sugar, and eggs in the Vitamix. Process on high for 5 minutes. Add the cubes of cold butter and process on low (setting 3) for 30 seconds. Pour into mason jars and refrigerate for at least 2 hours. 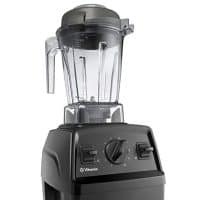 A Vitamix is a high speed blender that makes more than just smoothies. Blenders, start your engines! 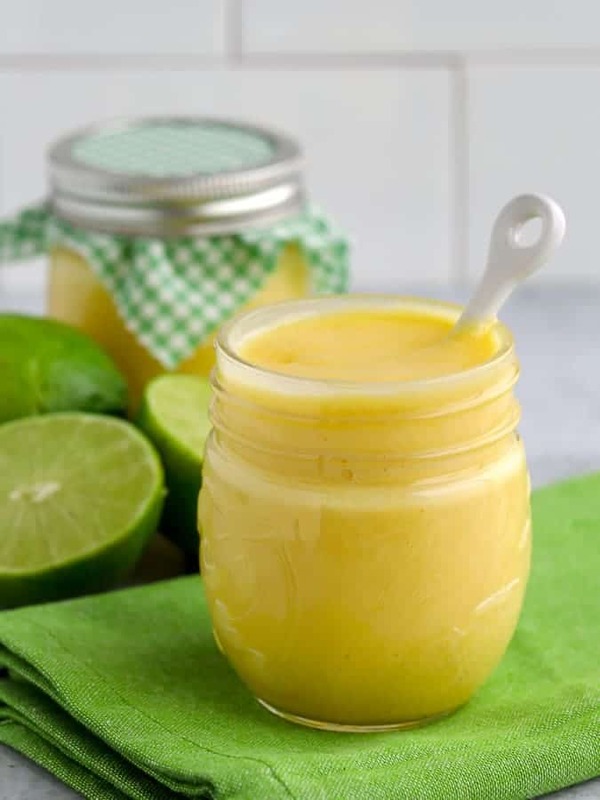 This lime curd in the Vitamix is a bright splash of taste and color. Make it with your Vitamix or Blendtec for a quick method of creating curds at home. While the traditional method of whisking the egg mixture over a double boiler works well, the blender method is so much faster. Ten minutes fast. I made lemon curd last year with the recipe listed in the Vitamix cookbook and followed the same proportions for this recipe with lime. The texture is smooth and custard-like even after the initial five minutes in the Vitamix; the curd will continue to thicken as it cools in the refrigerator. 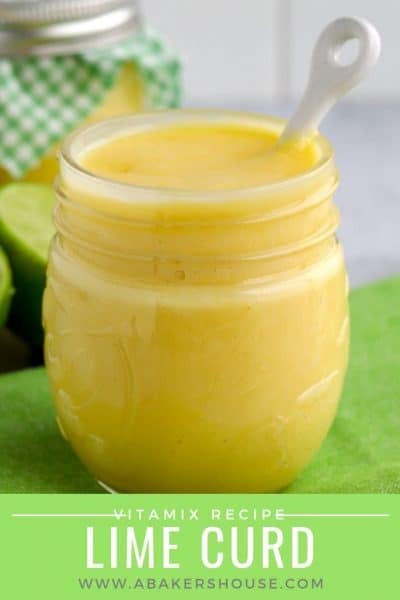 Do not make this easy lime curd recipe in a regular blender. The beauty of a Vitamix is that it raises the temperature of the ingredients during the 5 minute process time such that the eggs reach a safe temperature. Regular blenders simply don’t have that firepower. Read more information here about egg safety. Egg yolks must be cooked to 158 -160° to be safe to eat. You’ll notice that steam comes out of the Vitamix during the 5 minutes on high speed. Wear baking mitts when you remove the lid to add the butter so that you don’t get burned. How long does Lime Curd last? Lime curd lasts 1 to 2 weeks in the refrigerator. 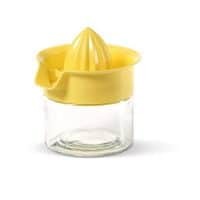 If you are an avid canner and make lots of jams and jellies, you’ll know that many preserves can be processed in a water bath canner to extend their shelf life. Curd is not a recipe for your water-bath canner. Recipes with eggs and butter are not suitable for a boiling water canner. By the way, are you surprised by the shade of yellow? Even with a healthy dose of lime zest, this curd can’t hold on to the vibrant lime green color. The eggs and butter overshadow it. I chose not to, but if you crave that green shade of lime in your curd then you’ll have to add a few drops of green food coloring. You can follow this recipe using key limes instead of regular limes. Key limes are smaller so make sure you plan ahead and buy more key limes than the number of limes in this recipe. Measure the lime juice and the zest and follow the recipe as listed. Quick tip: When you need citrus zest for a recipe and you also need the citrus juice, FIRST zest the lemons or limes and THEN cut them in half and squeeze out the juice. To easily take the zest (the outer layer) from the fruits, you’ll need the fruit in tact. Trying to zest a half of a lime that also has been squeezed already is not a recipe for success! 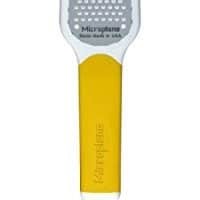 My favorite and most reliable citrus tool is this Microplane Citrus Tool. It makes zesting a breeze. You can zest small bits or curls of zest depending on the recipe requirements. Add the eggs, sugar, lime juice and lime zest to the Vitamix. Start at level 1 and slowly increase to level 10. Blend for 5 minutes. Turn off the Vitamix and add the butter. Start at level 1 and blend at level 3 for 30 seconds. Place lime curd in the refrigerator to cool. Store in refrigerator for 1-2 weeks. Make this lime curd recipe with either regular limes or key limes. Post originally published in 2014. Updated in 2019. When I finally win my Vitamix (it’s like a new grill, I refuse to buy them) I’m going to make all of your Vitamix recipes. This looks outstanding. We’ll have to find a cooking contest or a giveaway for the Vitamix for you! I agree, I had trouble buying one too so we used credit card miles instead. It’s a splurge but what a great appliance for the kitchen! Why oh why is this deliciousness called curd; we need to have a naming contest and the winner gets a new Vitamix! But happy I’m in; I do love it! Did you know we were exactly a mile apart? I walked over to your house the last time I dropped a treat off and was sad to know it was my last walk to see you– I’ll have to make the drive soon, once I get over this bad cold & cough. And yes, curd definitely needs a new name! I adore my Vitamix! My favorite recipe is the whole wheat dinner rolls, just amazing! I have been making curd on the stove top and have not tried the Vitamix recipe. Silly me! I’ve got to try this soon, very soon! I so want to own a vitamix, but am afraid the husband might just ask me to start working :)) I actually Love the color of your lime curd. I don’t think the green looks appetizing. Get better soon and we all should plan on meeting ! Yes, I completely get it! The Vitamix is a splurge (we got ours using airmiles so it was a big treat!) but maybe you could start now dropping hints for Mother’s Day, birthday, and more! Hope to see you soon. Totally surprised and delighted at your website – what a treat!! Question – I don’t have a vitamix. Is there something special about the vitamix, or can I do this recipe in my food processor? Wow, I love the idea of being able to make this in my Vitamix. Can’t wait to try it. I keep hearing about these Vitamix things. I need to get one! All I have is a cheap blender! This lime curd looks amazing, Holly. I think I’d be quite content eating this straight from the jar. I’ve made this recipe with lemons and lines and it’s fantastic! I’m making it again this weekend to use as a filling for lime squares! For those that have been dreaming of a Vitamix- I wish I would have purchased mine so much sooner! It’s the perfect kitchen appliance to elevate the cooking experience. I use mine pretty much daily and have much less food waste as I use up.ALL.my produce one way or another. Whether it’s in.a smoothie, sauce, or dressing. My recipes went from using canned ingredients to fresh. My meals are prepped faster, and use less steps and cookware. So glad you are enjoying this recipe and your Vitamix– I love mine too!It’s always fun to hear what recipes people love to make in their Vitamix.